We present utilization of VRML language as a tool for interactive visualisation of physical simulations. Techniques for creating interactive and visual simulations are analysed and practically implemented in form of a VRML library. Primary effort is focused to the real-time interactive work, but the off-line visualization of large data sets obtained from other simulation systems is allowed as well. Examples show that the proposed approach is easy to use, flexible and powerful enough to visualize both simple and more complex processes. With growing number of powerful computers being available to larger number of people, utilization of computers for more tasks is increasing. One of possible domains for using them is computer simulation of a real world or more particularly of physical phenomena. There are not many simple and yet available tools or programs, that enable creating that kind of simulations, that is why users are forced to create them by themselves. Creating of the simulations by this way is not acceptable for many users. The approach of using a well-known and fairily available programming language is tested as a solution of previously presented problem, so that user can use our work for creating of simulations with minimal programming experience. VRML language is chosen as a primary modeling environment for its capability to create interactive 3D worlds, wide availability on all types of computers, and great extendibility through scripts. The structure of this paper is organized as follows. Basic simulation concepts of real world simulations on computers are discussed in Chapter 2. In Chapter 3 these simulation concepts are implemented in VRML language. A group of utilities for assembling of simple simulations (Simulation Tool Box (STB) library) is presented in Chapter 3.1. Experimental simulations constructed with STB library are presented in Chapter 4. The simulation and visualisation of real world is a very extensive task, with a variety of problems and subtasks. For our purposes we will simplify the problems, theoretically covering the task of mathematical solving and representing of simulated phenomena. Let us assume, that a user is able to express the mathematical representation of a problem and he or she wants to embed this mathematical model only into a visual representation. If simulations are examined by means of their visual representation in computers, they can be divided into two separate groups. The first group, called "off-line" simulations, represents simulations, in which a user obtains computed values from a mathematical program outside simulation. Computation related to creating of simulation key values is not directly inside the simulation. The second group, called "on-line" simulations, represents simulations containing some sort of control that implement mathematical model of simulated phenomena. The user can change simulation parameters interactively, thereby he or she can immediately affect behaviour of the simulation. Visual model, which represents simulated phenomena or behaviour. 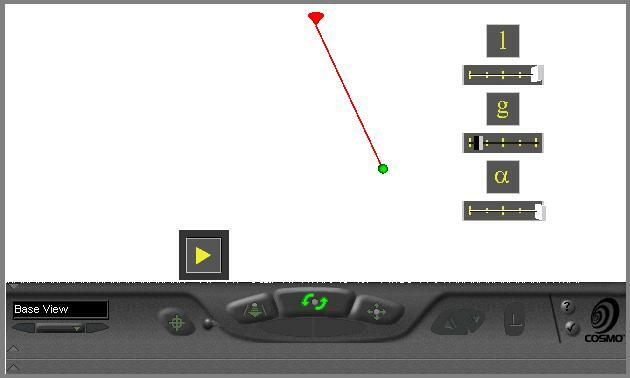 Graphical User Interface, dedicated to controlling of input values, visual representation and the run of simulation. Simulation control, which controls behaviour of simulation in response to user or other events. Figure 1: Basic simulation parts and their communication. Each part of simulation is discussed in following chapters. Objective of all simulations is to present results of mathematical computations (generated from an experimental theory or from an observation of real phenomena) to a user in a readable and understandable form. Primarily it is in form of tables of numbers, graphs or animated visualisation of simulation. The focus is set on the third form of visualisation, which enables creating applications in an interesting visual form, understandable also for users that are not theoretically familiar with presented problems. Main task of GUI is to create a visual interface between a user and a simulation control. This represents a set of visual displays that show actual state of simulation and simulated phenomena (e.g. different types of indicators, such as digital displays), and a set of control elements that allows interactively interfere with simulation (e.g. different types of buttons, controllers). The tasks of simulation control can be divided into two parts, each communicating with the other. The first part is the simulation control related to GUI. It traces user requests to change simulation parameters and supplies values for displays in GUI. The second part is related to control the run of simulation. It changes visual representation of simulation based on simulation parameters supplied from mathematical model (previously presented on-line type of simulation), or from other simulation program (off-line type of simulation). Particular properties of this division is discussed in next two chapters. This set of simulations uses an independent program, which can implement sophisticated algorithms and procedures for precise creation, representation and problem solution. Problems solved by this program can be so complex, that the results cannot be computed in real time. Then the computed data are preprocessed and finally sent to the simulation control. The off-line simulation present them to a user. The advantage of this approach is precision of computation model, which is based on program dedicated to solve simulation problems. This program can compute large simulation problems independently on user's machine, which is used only for presenting results to a user. In this case the visualisation is almost independent on mathematical model previously used. On the other hand the user is not able to view result dependecy on change in input parameters in real-time (e.g. immediately). The Figure 2 represents block diagram of off-line simulations. Figure 2: Off-line simulation scheme. Passive on-line simulations. Simulation solving engine computes behaviour of visualisation model once for one change of input values and then it "sleeps" until input values are changed again. This group is analogy of off-line simulations with the exception, that off-line simulations do not contain solving engine inside simulation. Passive simulations can be also used for simulating phenomena, which are independent of time (e.g. simulation of non-kinetic models). One good example can be simulation of reflection or refraction of rays inside a user defined and modified environment. Active on-line simulations. Simulation solving engine computes continuously behaviour of visualisation model based on current state of input values and on current time inside simulation. Such models can have kinetic equations implemented in simulation solving engine, which computes e.g. position based on actual time of simulation. This sort of simulations assume knowledge of the solution based on time, and it must be sufficiently simple to be computed in real time. Active simulations implement only simple simulations; main advantage of this solution is immediate response to user changes of input values. An example can be simulation of pendulum, based on all the parameters defined by the user (e.g. gravity). Figure 3 shows block diagram of both on-line simulation groups. Enable the development of computer programs capable of creating, editing, and maintaining VRML files, as well as automatic translation programs for converting other commonly used 3D file formats into VRML files. Provide the ability to use and combine dynamic 3D objects within a VRML world and thus allow re-usability. Provide the ability to add new object types not explicitly defined in VRML. Capable of implementation on a wide range of systems. Emphasize scalable, interactive performance on a wide variety of computing platforms. Enable arbitrarily large dynamic 3D worlds. Main structure of language is based on object oriented programming concepts. All parts of VRML scene is defined by group of object definitions in the source text of scene. It is defined by "nodes", in OOP terminology they can be called objects. Nodes have defined internal data - "fields" with default initial value, which can be redefined. Each node can contain input and output fields, called eventIn and eventOut. They generate or receive events to/from other nodes. This events are for example changes of object position or node's field value. For passing events between nodes mechanism of routes is created. ROUTE keyword defines interconnection between eventIn of one node (destination of event) and eventOut of second node (source of event). Visible geometry Nodes: Nodes representing basic geometric primitives (Box, Sphere, Cone, Cylinder), extended geometric primitives (IndexedFaceSet, Extrusion, Text), special objects (IndexedPointSet, IndexedLineSet). Nodes used for changing visual representation of geometry by defining its colour (Material) and textures (ImageTexture, MovieTexture). Nodes used for changing background of scene (Background) and nodes adding special visual effects (Fog). Sensors: Invisible nodes which enables direct interaction with user (TouchSensor, PlaneSensor, CylinderSensor). Nodes detecting movement of user (ProximitySensor) or other events created by user movement (VisibilitySensor). Browser communication: Nodes used for interaction with host browser (NavigationInfo) or used for creating links to other HTML or VRML documents (Anchor). Special nodes: Nodes used for grouping other children nodes thus enabling creation of hierarchical structure of nodes in scene (Group, Transform, Billboard, Collision, Switch, LOD). Sound emitting node (Sound). Node changing style of text nodes (FontStyle). Basic structure of interaction process in VRML scene is on Figure 4 . A user does some interaction with VRML scene, affecting Sensor node. Sensor node then generate an event, which is processed through Script and is sent to TimeSensor. TimeSensor starts generating time events, used for interpolating in Interpolator node. Output of Interpolator node is routed to Geometry or other node. This is a very basic concept, some of described nodes can be bypassed or some other can be inserted into the event route. In the VRML scene more of these event routes can be used independently or they can affect each other. Simulation parts described in Chapter 2 can be implemented in VRML in the way schematically described on Figure 5 . Simulation control part controls operation of the whole VRML scene. It is implemented by Script node. Script gets input values from input GUI nodes, creates values for output GUI nodes and communicates with scene geometry. In off-line simulations Script does not compute any new values for scene geometry, it controls only "playback" of precomputed values stored in interpolator nodes. Scripts in on-line simulations are more complex, they must compute actual values of simulation based on values from input GUI nodes. Script node is interconnected with TimeSensor node, which is used for generation of simulation time. GUI is divided into two parts: input components (nodes used for user input) and output components - displays (nodes presenting data to user). These components can contain sensors (input components only), visible geometry and control scripts implementing behaviour of component. Input and output events from them are then routed to control script. Simulation geometry contains geometry used for visualization of simulation subject. For off-line simulations there is also an interpolator node, used in conjunction with TimeSensor for playback of precomputed key values of simulation. Based on concepts introduced in Chapter 3.1, library of basic elements is proposed. It contains basic components used for building simple simulations. This library is called Simulation tool box or STB. It is created using concept of external VRML prototypes (EXTERNPROTO), which enable to create new types of nodes. The nodes are defined outside main simulation VRML file and they are imported using EXTERNPROTO keywords. Main simulation file then contains only references to used external nodes, geometry used for visualization of simulation and main simulation script. Input GUI components - Components used for data input; this part implements set of buttons, scrollbars, knobs etc. Output GUI components - Components used for displaying data; this part implements set of indicators, gaugers, displays etc. Other components - Set of auxiliary components, designated for simplifying common tasks (e.g. steppable TimeSensor or components used for data conversions between different VRML data types). For demonstration purposes few simple examples of simulations in VRML are created. In this chapter implementation of STB library from Chapter 3.2 and its utilization in a pendulum example is presented. Example of simple STB library contains set of usable components, implementing GUI components and simple auxiliary components. SFBoolean: Implemented by set of buttons (inpButton). SFInt32: Implemented by switches (inpMultiSwitch). SFFloat: Implemented by set of scrollbars, knobs a digital calculator (inpScrollBar, inpKnob, inpFloatDigitalCalc). Other data inputs can be done by using standard types and converting components (e.g. three SFFloat data inputs can be converted to one SFColor data value). SFBoolean: Implemented by indicators (disShowBool). SFInt32: Implemented by indicators with multiple shapes or colours (disShowInt32). SFFloat: Implemented by set of scrollbars and knobs (disShowFloat, disShowFloatKnob) or by digital display (disShowFloatDigital). SFString: Components used for creating text labels (disTextLabel). Other VRML types can be converted to supported data types (e.g. SFColor converted to three SFFloat values can be displayed by three scrollbars). conBoolInt32: Converts SFBoolean to two possible SFInt32 values. conFloatVec2: Converts two SFFloat values to one SFVec2f value. conColFloat: Converts SFColor value to its three SFFloat components. Next set of auxiliary components are supporting scripts, like steppable TimeSensor and script implementing simple control panel. Steppable TimeSensor component (stepTimeSensor) is able to generate time events like standard TimeSensor, or time can be stepped by defined time slice forward or backward. Generated time can be also accelerated or decelerated with respect to real time (e.g. one second in simulation can be 10 seconds in real time). Table 1 shows program interface (EXTERNPROTO) of a component from STB library. This EXTERPROTO is included in source code of VRML scene. Then the component is used in the same way as standard nodes, that is by its name and definition of new values. Component header - contains VRML file header and definition of PROTO header, in which all public data fields and events of component are defined. Component geometry - contains sensor and geometry of component. This part of component is visible to a user. Component control script - contains script, which is controlling behaviour of component, controls data input, output and changes to component geometry. Component routes - this part defines ROUTEs used for linking geometry and script of component. 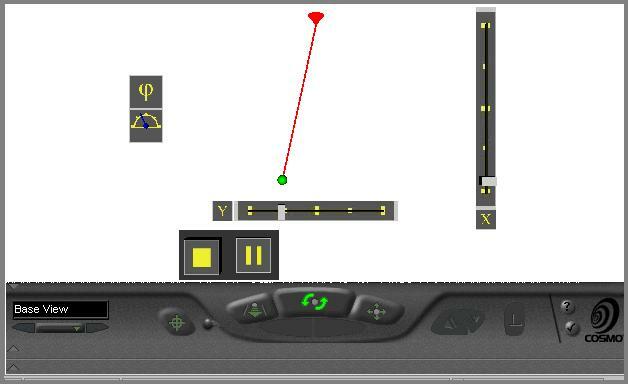 Figure 6 shows some examples of GUI components. We have developed several experimental simulations using STB library presented previously in Chapter 4.1. One of them is simple mathematical pendulum, implementing well-known simplified kinetic equation (see Figure 7). The equation is implemented in simulation's control script. The script receives time events from TimeSensor, computes new actual position (rotation) of a pendulum and updates corresponding geometry. The user can change the gravity, the length and the starting angle of the pendulum. Example of screen with simulation in phase of setting input values is in Figure 8 . When the simulation is started, pendulum starts moving, according to the parameters entered by user. Set of associated displays shows current values of interest (the angle, the position of a pendulum). Figure 9 shows example of moving pendulum. VRML file header - contains VRML header and EXTERNPROTOs for components included from STB library. GUI part - contains definition of GUI using STB library components. Simulation geometry - geometrical representation of mathematical pendulum. Simulation control - a script which controls behaviour of scene. ROUTEs definitions - definitions of event links in scene. All calculations needed by simulation are implemented by Script node in simulation control part. The use of VRML as general purpose simulation tool shows several aspects of this language. The language is well defined and makes possible to create a large set of interactive simulations. Concept of off-line simulations can enable its usability to visualize more complex simulations. Presented STB library is only a part of more complex work, which implements set of tools for simple and interactive construction of simulations in VRML. STB library implements basic components used in common simulations in VRML, like GUI and auxiliary components. It can be used as a standalone library, components can be imported into any other VRML scenes. Advantage of this concept is independence of current implementation of components in STB library if its program interface remains the same. Components can be upgraded by means of visual representation and scene, which is using them, does not need to be changed. Disadvantage of this concept is necessity of manual including of EXTERNPROTOs definitions into VRML file, because VRML prohibits to import them by single keyword. STB library and examples presented in Chapter 4 are tested on well-known CosmoPlayer browser from SiliconGraphics. This browser (by our experience) implements most of VRMLs with minimum errors. This article is focused on basic simulation concepts and their testing in implementation of on-line simulations. We are working on extending of STB library with tools for visual construction of scenes. We also pay efforts toward generalization of STB into form, usable by other available products (e.g. CosmoWorlds). The second task is creation of experimental off-line simulations, which will utilize general purpose simulation systems as a base source of simulation values. Example of this system is TeleSimulation Project - Simulation of multidisciplinary systems via Internet.